Do NOT check the option for “friends and family”. Just a tip. I wouldnt use pp for selling a game unless ive done business with them before. Highly risky selling a game to a newbie or first time buyer as they are more likely to not realize that pinball machines do break thus they have the power to reverse charges in a case of a few bad lamps. Cash on glass is the best. 2 ways. If out of state, make sure they have plenty of Feedback...and it's good. You can also list Pick Up Only. They will have to come to you. Just go old school. Take a personal check. Once the check clears the bank then ship. A cleared personal check is not going to blow back on you. Or go with a bank wire. PayPal can come in after you have shipped and bite you by pulling funds from your account. You can’t trust cashiers checks. But a personal check if final. A bank wire is final. No one can come in and make a clawback. Actually if your the one collecting the money having them send it "friends and family" is the way to go because then you don't get charged the 3% fee and they can not file a claim on you to get their money back. On the flip side of that if you are the buyer I wouldn't do that unless the seller is a reputable person as there is no way for you to get your money back if there is a problem. A personal check can take up to 3 weeks to fully clear. A stop payment can also be done on a personal check. A personal check can be forged just as easily as a cashiers check. I would take a cashiers check before a personal check but would prefer a bank wire or cash over either. I’ve used escrow.com several times and smooth no worry transactions. The small fee is worth not having to deal with the BS. If the buyer objects, tell him to go pound sand! Cash on the glass is always best but that obviously doesn’t work with long distance deals. Possibly you had someone that sent you money report you for doing it? This! I had someone offer to Paypal me for an arcade cabinet. I told them I don't have Paypal. This is not entirely true and something I see at work all the time. You can dispute a wire for up to 60 days after you receive your statement (https://www.consumerfinance.gov/policy-compliance/rulemaking/regulations/1005/11/) with your financial institution, plus the length (10 - 45 days) of the investigation. The money isn't really "safe" for several months after the transfer. Go with cash. I've used paypal for many of my transactions (3x times buyer, 1x seller). Always has been friends and family, and have had ZERO issues. Actually if your the one collecting the money having them send it "friends and family" is the way to go because then you don't get charged the 3% fee and they can not file a claim on you to get their money back. That is a common misunderstanding about money sent via friends and family. With friends and family payments they can not file a dispute through PayPal, but they can still file a dispute with their bank or credit card company. With bank funded payments, they can be disputed for 30 to 60 days depending on who they bank with. With credit card payments they can be disputed for up to 6 months. So there is a risk taking a PayPal payment even if it is sent via friends and family. 3 weeks to clear a check in this day and age? It used to be there was a thing called the "float" that business made use of frequently. You might haver got a 10-day float as your bank would mail transactions to a bank on the other side of the country. In our electronic age, once your money is in the banks' systems it can in another bank in the blink of an eye. You can walk a personal check into your bank and have your bank call the bank the check is written against to confirm that there are enough funds for the check to clear. If your bank says the check will not clear, then you have an issue with your buyer. If your bank confirms the check will clear then make the deposit. It is not much different if the buyer lives in the same town as you. You can walk into his bank and cash the check and walk out with the cash--if the check will clear. If it won't clear at the counter then you have issue with your buyer. Stop payments work only if the check has not already cleared. If it is a forged check, a call from your bank will put light on it. And you have issue with your buyer. Maybe your bank can call about a cashier's check to verify, but I don't think so. So after reading all this, What does everyone suggest other than "Cash on the Glass" to protect yourself from getting scammed? Im getting ready to sell a Ghostbusters, and don't want to get screwed out of my game. Usually I'm not opposed to doing business with someone out of state, but now Im thinking twice about that. I saw someone posted to use escrow.com. Anyone else tried that? Being a former business owner of a retail bicycle shop, I would get disputed checks every so often, after the money had been deposited. Then I was out the money and the product. Had to file a police report etc....which did nothing. For the record I have never had an issue buying and selling with Paypal. However on large purchases, I would rather pay a little extra and have an invoice from the seller as protection. As a Seller, friends and family the money. Newbie here, just bought an out of state game and have sold tons of items in other hobbies with Paypal. I've never once had a problem with Paypal, but you do need to be careful as others have said. 2. Paypal friends and family. All risk is on the buyer with this, same as WU. No chance of the buyer filing a claim or losing money when you're the seller with this option. If they don't want to do friends and family, tell them to go pound sand then. Escrow.com worked for me. It was around $170.00 if I remember right. We split that cost evenly. Added security for both of us. When I buy a game, to show my true interest in the game, I normally send a 10% non-refundable deposit through PayPal. The rest, I put cash in the owner's hand - unless I don't plan to make the drive (when I bought JM from a Pinsider in AZ for example). Never had an issue. Of course, I've always been the buyer. Don't forget to pay taxes on all those games sold! Go to your bank and the account that Paypal sends to, request a Block Paypal from the ability to remove any funds. Should there by any issues, they cant hurt your account. Lot of tinfoil hats in here. If you want cash on glass you limit buyers. I use PP friends and family all the time to buy and sell. Never an issue. Make sure the buyer/seller is reputable and stop stressing. I’ll accept a deposit via PayPal, but I normally want cash on glass unless they are a highly reputable pinsider. I have sold many high end expensive machines via PayPal with no issues. Also shipped them as well. Guess I like to live dangerously. Pretty much this. It's a "tinfoil hat" until they take your money back. Happened to me once, haven't used it since, won't use it again. That's why you use it for ONLY people you know very well - friends you've built up in the hobby doing business with them for years. No way I'd do PayPal blindly for the full balance. Who's "they"? 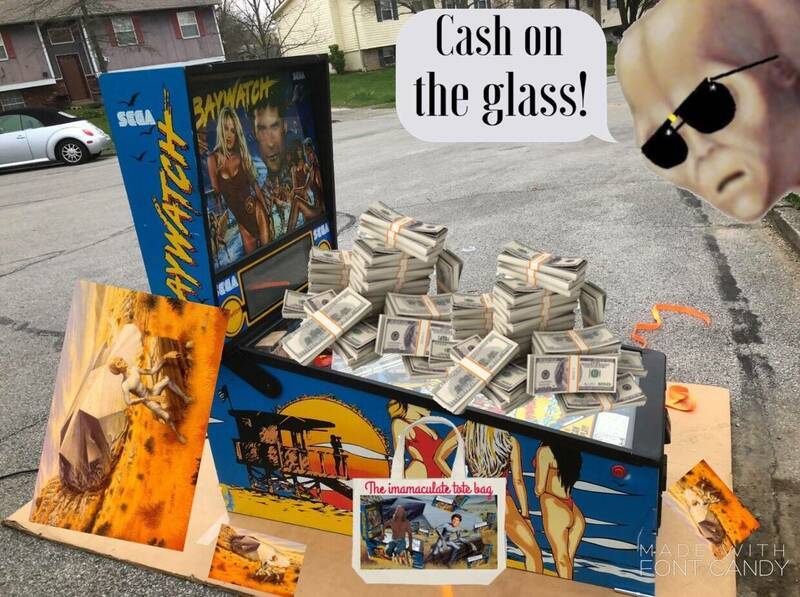 Reputable buyers and sells off of pinside or randoms the accents and google phone accounts off of mr_pinball classifieds? If you have half a brain you can avoid getting burned. Every form of payment has potential for scams other than cash on glass (could still be counterfeit) but you drastically limit your buying and selling options with cash unless you drive hours. In the next decade I wouldn't be surprised if we were a cashless society. I’ve used both PayPal and google pay many times without any issues both buying and selling. As the seller I have in the past turned down escrow.com because if I’m selling a game and someone doesn’t want to take the initiative to pick it up then they take responsibility for anything happening during shipping. The last thing you want is someone shipping your game and it gets damaged during shipping and they refuse to pay you so you’re stuck with a broken game in another city or state and no money. The person requesting the shipping should always be responsible for damage incurred during shipping. Just my 2 cents. In my case, PayPal took it and returned it to the buyer/scammer. I sold some stuff on Ebay, shipped with both insurance and tracking. The buyer claimed with PayPal it never arrived. I submitted my receipt with their zip code, my credit card statement, and the delivery conformation. Since I didn't send it signature confirmed there was "not enough evidence" to deny his claim and the money was returned and my stuff was gone. That was the last time I sold anything on Ebay and took PayPal from someone I didn't know. It's not about what you do unfortunately, it's about the case the other person can make and the luck of the draw with PayPal who is notorious for siding with buyers. I'll take my chances with the counterfeit cash over some dude in a call center making 10 bucks an hour reading a script at PayPal who doesn't have a dog in the fight. I'm honestly not trying to start world war 3 over PayPal, other people taking it has no impact on my life so go nuts, but just don't mistake taking steps to protect yourself mislead you into thinking there's a 0% chance you'll lose money when you're not the only party involved. Ebay is your problem, not PayPal. They screwed me and I fought them. I posted a thread about it and I won. It was a PayPal dispute and all contact through PayPal. Sounds like you had the opposite experience which explains our differing views on it. you can get one of those counterfeit pens and check the cash. If someone wants to scam you, they can scam you. Does everyone here use one of those counterfeit pens? Do you check every single bill in a large transaction? I’ll be honest and admit I never have. Luckily to my knowledge, I’ve never been scammed. I’d advise anyone to avoid any deal you don’t feel comfortable with. If there are any red flags pointing to a possible scam, avoid the deal and move on. The best way to make deals are to deal with reputable sellers/buyers and check their feedback. Every cash on glass transaction I’ve had the seller literally hands me a sealed bank note envelope like US Bank, Bank of America, etc and I open it and count it. I’ve always worried about fake cash but I have no idea how I would check it. So after reading all this, What does everyone suggest other than "Cash on the Glass" to protect yourself from getting scammed? There are so many dangerous old wivestales in this thread, it's almost like 90% of the people want to see you get ripped off. Game doesn’t ship until escrow has funds from buyer and can’t be reversed. Very secure for a small fee. If you don’t feel comfortable with the buyer I highly recommend this service. I’ve been involved in a couple shady cash on the glass transactions where my main concern was not getting mugged and robbed.